Artists from the Chester County Art Association are participating in the Second Annual Paint the Town Event, which will run through Friday, culminating in a show and sale. 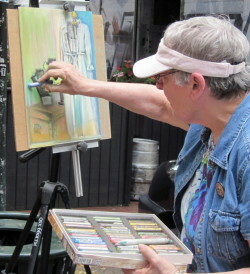 The Chester County Art Association is holding its Second Annual Paint the Town Event this week in downtown West Chester. Painters will be set up throughout the borough creating art and interacting with the public through Friday – a prelude to a show and sale at the corner of Church and Gay Streets from 5 to 9 p.m. during the borough’s monthly Gallery Walk. Another free, artistic and culinary happening will be held from 6 to 9 p.m. as the Roots Café debuts at 133 E. Gay St., the former site of Gilmore’s Restaurant. 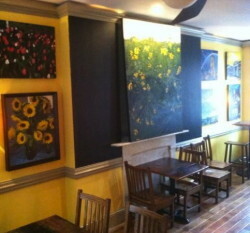 Paintings by West Chester artist John Hannafin will be on view at the new Roots Cafe. 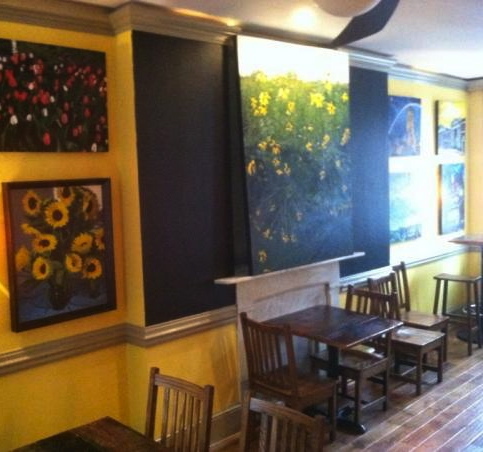 Artwork by West Chester painter John Hannafin will be on display, live acoustic music will be performed by Mike Nappi, and gourmet farm-to-table samples from Roots Café chef and owner Dan Cellucci will be available for tasting. In addition, Hannafin will do a live-performance painting of Nappi. In addition to numerous art show openings, this month’s Gallery Walk will include Classic Towns Photo Contest winners at 17 E. Gay St., and a Vintage Garage Sale at the Chestnut Street Garage, featuring 20 vendors, food trucks and live jazz.